Last week I hadn't heard of Kate Nash and this week I'm turning up to her gig half-drunk and in desperate need of a piss, "why?" 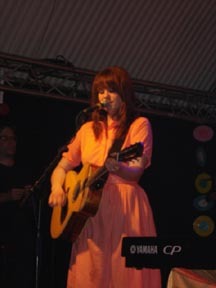 you may ask, well because after stumbling across her MySpace and buying her latest single, 'Caroline's a Victim', I have come to the conclusion that this girl is a brilliantly talented musician and her brand of anti-folk indie pop is quite ace. 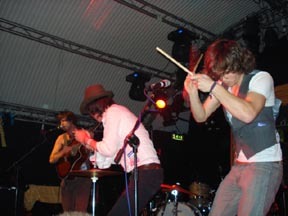 The Wallbirds are a three piece country band, proper country mind, with a harmonica. Their set is a rather chaotic sounding "hoe-down" and the energy displayed by the band makes them an instant hit with the crowd. Stand out songs from the set include '8 O'clock Blues' and 'Changes with the Moon' both are quite slow numbers, yet the band remain energetic throughout. At times The Wallbirds are reminiscent of The Broken Family Band and 'Changes with Moon' sounds similar to 'It's All Over'. Country music has a rich history and a fair amount of very talented musicians; it is often very difficult to stand out in such company as Johnny Cash, Bob Dylan, Hank Williams et al but The Wallbirds might just have what it takes, all they need to do is stay off the "swish". As Kate emerges onto the stage it is to rapturous applause, shouts of "'iya!" screams, wolf whistles and cat calls, she sits down behind her keyboard with a big grin on her face and simply says "That's mental, thanks". With the London twang present in all her songs it's easy to compare Kate to Lily Allen but you could also say that there is a little bit of Emmy the Great mixed in with a dash of Laura Groves rattling around in the 19 year old songstress. Whether she was sitting behind her keyboard or playing her acoustic guitar Kate was impressive and she had a huge smile plastered on her face, she seemed to be genuinely happy to be playing to the packed, hot and sweaty main room of the Cockpit. Kate's set was a brilliant anti-folk affair and included some rather brilliant songs, my favourite of which had to be 'Dickhead' a simple little acoustic song about, well a dickhead, an acoustic version of the synth-driven 'Caroline's a Victim' was surprisingly good, I didn't expect it to work with an acoustic guitar but it was really very good. Upcoming single, 'Foundations' sounds like a gorgeous indie pop number throughout which Kate gives the crowd the middle finger. The closing two songs 'Merry Happy' and 'Little Red' are amazingly simple little keyboard driven songs which seem to satiate the crowd's desire for Kate to stay and play all night, something she says she wishes she could do. Kate delivered a brilliant set of wondrous anti-folk indie pop songs, keep both eyes on this cheeky southerner; I have a feeling she is going to be big this year. She will be returning to Leeds for the O2 Wireless Festival, so if you are there on the Saturday, check her out. the wallbirds are ace seen them in inverness last night supporting the pigeons and they blew them out the water. hope to see them again sometime soon. I saw the wallbirds at Nottingham last night supporting the pigeons. I never wanted the wallbirds set to end. They made the pigeon detectives look a bit silly! I watched them last night supporting one night only, they were amazing!